The war began because the 13 colonies on American soil didn't have the same rules as the British civils on the Britsh island. So it was prohibited to issue his own paper money and there were taxes on glass, paper and other stuff raised. In 1773 it came to the ,,Boston Tea Party´´ (the tea was thrown over the board). After that the port was closed by the British. 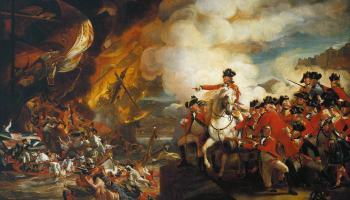 In 1775 it came to the first war in the war of independence between the British and the colonists. The colonists declared George Washington to the supreme commander but the troops of the colonists weren't as strong as the British, so they lost lots of fights. At the 4th of July 1776 Thomas Jefferson designed a declaration of independence. The colonists were suporeted by Ludwig the XVI with weapons so they were much stronger. In winter 1777 many of the colonists died of hunger or the sickness. In spring the situation has improved again. Ludwig the XVI sent soldiers to protect the colonists. The American and the French troops wer now in the majority and forced them on 9th of October 1781 to the fight. In 9/3/1783 peace was made in Paris and America was finally independent. 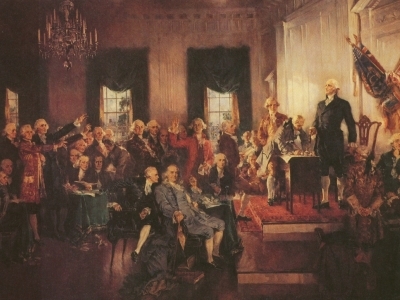 In 1789 George Washington was the first president of the United States of America.